Chunk Colbert (18? ?-1875) – Colbert established a reputation as a gunman during the early 1870’s, reputedly killing seven men in West Texas, New Mexico, and Colorado. In the early 1870’s, he shot and killed Charles Morris in Cimarron, New Mexico, after becoming convinced that Morris was a little too interested in Mrs. Colbert. However, he made a deadly mistake when he decided to tangle with the likes of a far superior gunfighter – that of Clay Allison. On January 7, 1875, Colbert and Allison went to the Clifton House, an inn in Colfax County, New Mexico, after racing their horses in a quarter-mile trot. When the pair sat down for dinner, Colbert allegedly fancied that he could get the “drop” on Allison, who some say had killed his uncle nine years earlier. Guessing that there might be trouble, Clay was very cautious but, the talk was friendly as they enjoyed a large meal spread out before them. When they were seated it Colbert laid his gun in his lap and Allison laid his gun on the table. After the meal was finished Colbert suddenly reached for his gun under the table and leveled it towards Allison. 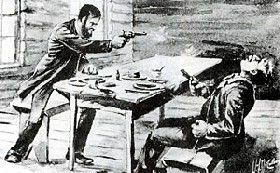 The perceptive Allison followed suit and when Colbert’s gun nicked the table, the shot was deflected and Allison shot him in the head. Later Allison was asked why He had accepted to have a meal with him and answered, “Because I didn’t want to send a man to hell on an empty stomach.” Colbert was buried in an unmarked grave behind the Clifton House. Chunk’s friend, Charles Cooper disappeared soon after Chunk’s death. It was assumed he was killed by Clay Allison. Cooper was last seen on January 19, 1874. Allison was arrested for his murder but was soon released for due to the lack of evidence. By Kathy Weiser-Alexander, July, 2017.